Scubapro EverFlex Steamer 7/5mm Men's Wetsuit, Black/Gray. 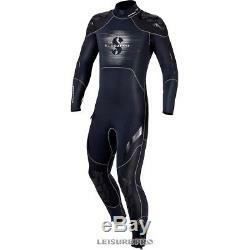 Scubapro EverFlex Steamer 7/5mm Men's Wetsuit. Scubapro's advanced, extra-comfortable EverFlex line has been stylishly redesigned to give you even better fit and freedom. Many of the same tested features are included, but EverFlex neoprene steamers are now in a pre-formed dimensional shape so it fits and moves more naturally with your body and delivers unparalleled comfort, stretch and flexibility. Scubapro has also added heliospan lining in the torso area of the steamers, for added protection and insulation. EverFlex provides excellent fit for a wide range of people. If you are tired of the struggle to get into your suit, EverFlex is for you. This Scuba Pro 100% EverFlex 7/5mm Steamer is for temperate water dives. Glued then double-blind stitched outer seams and single-blind stitched inner seams mean virtually water-tight seams overall, for extra durability and comfort. The Steamer is also equipped with a compression-molded combination zipper flap/spine pad to reduce water entry and improve back protection. The anatomically preformed pattern design feels like a second skin. Built-to-last with Power Tex abrasion resistant shoulders and seat along with durable TATEX kneepads a thermoplastic rubber (TPR) that is applied without glue or stitching. Suit has safe-straps on both arms for a securing of wrist instruments such as dive computers, depth gauges or compass. The easy self donning and doffing suit has a back zipper with a durable metal zipper slider, pull tab leash, nylon webbing thumb loop at base of zipper and ankle zippers with Glide-Skin seals. The suit is available in multiple sizes and is black and gray in color. Advanced, Extra-Comfortable EverFlex Line of Suits. Stylishly Redesigned to Give Better Fit and Freedom. Fits and Moves Naturally with Body. Delivers Unparalleled Comfort, Stretch and Flexibility. 100% EVERFLEX Material: X-Foam Nylon 2 Neoprene an Exclusive Scuba Pro Formula Complies w/Strict P. (Polycyclic Aromatic Hydrocarbons) Better Protect Divers and Our-Seas. Glide Skin Seals: Keeps You Warmer-Longer. Torso HELIOSPAN Lining: Fine Fleece Absorbs and Retains Water Keeps-You Warm Thru-Out Dive. Anatomically Preformed Pattern Design: Feels Like a Second-Skin. Safe-Straps on Both Arms: Secures Wrist Instruments Dive Computers, Depth Gauges or Compass Safely Secures Instruments. Seam Construction: Glued Outer Seams; Double-Blind Stitched Inner Seams; Single-Blind Stitched Virtually Water-Tight Seams Extra Durability and Comfort. Built-to-Last: Power Tex Abrasion Resistant Shoulders and Seat Durable TATEX Kneepads Thermoplastic Rubber (TPR) Applied w/o Glue or Stitching. Easy Self Donning and Doffing Back Zipper Design. Pull Tab Leash and Nylon Webbing Thumb Loop at Base of Zipper. Glued, Outer Seams; Double-Blind Stitched, Inner Seams; Single-Blind Stitched. Back Zipper with Metal Slider and Pull Tab Leash, Adjustable Collar. Feedback is a very powerful tool. It gives sellers a reason to conduct business at the highest level of honesty & respect. Many years ago Leisure Pro was the first Internet-based divers supply company. We're still the number one store for scuba diving and snorkeling equipment. Thousands and thousands of satisfied customers swear by our service. Hours: Mon-Thu: 9:30-5:30, Friday: 9:30-12:30. Please do not request to have an item relisted if you do not see it any more. If we are able to relist, we will do so even without your request. We will not mark any package as a gift. You will get that automatically. Then, we give another 90 days (120 days from the date of invoice) to return for store credit. We won't even ask why you've changed your mind. Please wait 8 days from date we received the package for us to process your return. The item "Scubapro EverFlex Steamer 7/5mm Men's Wetsuit, Black/Gray" is in sale since Thursday, December 14, 2017. This item is in the category "Sporting Goods\Water Sports\Wetsuits & Drysuits\Wetsuits\Men". The seller is "leisurepro" and is located in Elizabeth, New Jersey. This item can be shipped to United States.